For content creators, the best thing is to make people engage in their contents and being recognized by earning the top spot on Google. But how do you do it? The simple answer is by amplifying your content’s reach with social media. Because more than 2 billion people who use the internet today are using social media networks. This is almost the 70% of the total internet users. So, there are more chances that your contents will be viewed by many social media users. You have to shift your contents and its promotion to the area where people have more chances for engagement. They will tell you the type of contents they want and time for engagement. Social media is the strong medium in amplifying the engagement or reach to your content because as I said earlier that a great number of people are using it. But by just posting the regular contents does not work. To gain more reach from audiences using social media, you have to follow some tips. So how you can just make your content more engaging in social media? Social media is a fascinating platform. You can find multimedia like photos and videos, some interesting quotes and also statistics figures in numbers. This means people love to engage with posts with attractive and appealing contents. There is recent research regarding the Twitter’s sources of higher engagement. According to this, Tweets containing PHOTOS boosts 35% in retweets and the tweets containing VIDEOS boosts 28% in retweets. Furthermore, there’s another factor that matters in tweets. The links about 25% into a tweet have the highest click through rate. Timing matters the most if you are trying to engage people through social media. You must have to realize the timing of the people spending on social media. For example, mostly Facebook and Twitter posts are better viewed in the morning and evening times. Similarly, Linkedin posts are engaged better during the day times because Linkedin is more professional to use at work. Apart from timing, you would want to go and check out the overview of the posts you published overtime. Since every business has unique audiences, you should record your results. There are other different ways you can review your views over time based on social medias. There’s Analytics on Twitter which is the best way to know your posts engagements and other activities. Similarly, you can use RedditLater for Reddit which not only schedules your posts but also alerts you with the best timing for publishing new posts. These are the most used and popular tools that helps in amplifying your content’s reach with social media. The more lengthy and researched based is your content, the more chances are there to rank your article on search engines. However, the shorter article has more chances to receive more comments. Similarly, the mid-length articles are more shared than others. So if you want to have your website to be ranked higher in search engines and gain higher domain and page authority, you need have lengthy but researched articles. Even the length matters in social media. Twitter, for instance, have just 140 characters limit for a tweet and the tweets below 100 characters has chances of 18% more engagement. Almost similar goes with the Facebook posts, even better. Facebook found out that the posts with less than 80 characters receive engagements over 65%. Social Sharing buttons enabled in your articles makes the chances higher that your post is going to be shared on popular social sites. So you only have to enable those sharing plugins, the rest is done by visitors by sharing. Some of the popular plugins for WordPress users are AddToAny, ShareThis, AddThis, and ShareButtons. 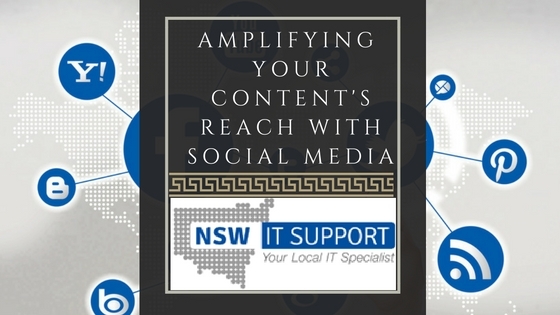 After learning all these tips and ideas regarding amplifying your content’s reach with social media, you can now apply it and increase the reach and engagement to your site.